What is Google mobile ads missing? Google launched mobile image ads a few days back, and i have been asking myself will they work? Techcrunch also ran a poll and unsurprisingly a large portion of people selected that they would not follow a mobile ad. However Google does point out that with increasing usage of mobile internet & larger screen sizes this market will soon take off. This report from cellular news says it will be a 10 Billion market by 2010. Thats quite possible. Though is the ad placement technology currently ready for mobile internet? You are most likely accessing the internet on your mobile phone when you are out & about, at the mall, on the beach, in your car, waiting in line at the bank, the point being you are currently doing something else. You are doing some sort of ACTIVITY and your mobile phone is just there to add value. When you sit at your desktop/laptop you are most likely sitting down with the specific purpose of achieving something such as surfing the net, typing out a document, researching some topic,, catching up with social networks/email. There in lies the fundamental difference in how we access the internet on PC/LAPTOP vs a mobile device. Just for a moment, analyse the psychology of this and the motivations behind it. With the traditional method of accessing the net we make the decision to set away time to spend at the computer and surf the internet, we are doing nothing else but sitting at the computer. With mobile devices we are making a decision to DO something else. The mobile phone and by extension the internet is there purely to serve a purpose which is to add value at that specific time, in that particular context. It may be used to do all of the things we do on traditional desktops/laptops but it usually means we are also doing something else. This is why mobile ads may not prove as lucrative with enough click through as your normal internet ads. The time you have when you are accessing a mobile device is of HIGHER value, then when you are sitting at your desktop surfing the net. Therefore you are less likely to click on a link for an AD. The AD has to be much more relevant than it is currently. Yes, Google ads are currently relevant using the query, possibly the location of your IP and other factors but with mobile ads there needs to be another level of relevance and that is CONTEXT. What is the user doing at that point in time? What is he actually looking for? Where is he? And that's what's currently missing from Google mobile ads, Relevance + Context. I have ideas on how to achieve that but we can save that for another day. There have been numerous reports of iphone shortages in Apple stores in the US. Check out news24 for the latest article on this or this article which speculated the shortages were due the launch of a 3G version. 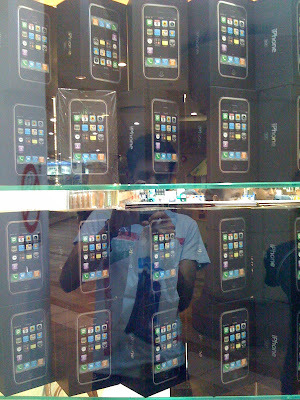 The main reason seems to be unexpected demand from the grey market (Imported via improper channels) and a large portion of these phones are displayed in stores here in Dubai. The owner in this store even put a little sticker on the boxes with contact details and 'distributed by'. I asked him if he could get me 100, he said he would need two weeks. I wonder if Apple stores in the US can match that? Suddenly everyone seems to have an Iphone, everyone seems to be walking around with those signature white buds in their ears. Yet people are still buying the phone. Apple has created such a brilliant phone that even people who dont own Macs, ipods and are not Apple fanatics are jumping at the chance to pick one up. Even with no advertising or marketing. - AT&T pays Apple for customer acquisition. Now consider a case like the UAE, where mobile penetration is in excess of 110% (People have more then one phone) there is no reason to use the phone to drive customer acquisition. Also in most other parts of the world there are a few operators with significant market shares who do not need exclusivity with a particular handset to drive market share like AT&T did. - Operators tend to subsididze mobile phones, even offering them practically at no charge. With the additional costs, the model of subsidizing the handset fully by operators is unlikely. - With the demand for grey market iphones, operators are receiving the benefit of increased data usage without any payout to Apple. They could also capitalize on this market by offering a flat fee on data usage without ever signing up for a deal with Apple. - The mobile market has been plagued for years with unlocking, operators subsidize handsets the customer signs up for the contract, unlocks the phone and stays on his original network. Also to date there has never been phone that was not successfully unlocked within a short space of time. The battle against the unlockers is a loosing one. - Every manufacturer out there is planning an Iphone Killer, and if the handset is just as good without the Apple business model who do you think operators will choose? All of this makes a deal with Apple very unattractive, hence my statement in this post about Apple needing a more attractive business model. They need to rethink their business model in the rest of the world. Especially if they want to achieve a healthy market share in the mobile market and knock the likes of Nokia out. They could drop the entire business model of the operator paying them back for each acquisition as this does not make sense for an operator who already dominates the market. They concentrate on offering consumer services such as ITunes (Music,Applications & Conent). They should also integrate the phone more with the network, as they did with visual voicemail which is unusable in other parts of the world, an example would be location based services and content delivery. With the release of the 3G iphone, they could offer Youtube / ITunes over 3G, making the deal more attractive and with this a revenue sharing agreement based on data usage of iphone users. Operators would also benefit as they could finally start seeing some ROI on their 3G roll out & licensing costs. Now.... that would be a winning formula and when ill be investing in Apple stock. Dont cry wolf Techcrunch, Mainstream media is not dead! Being a regular reader of techcrunch i naturally followed them via twitter and this afternoon news broke on the techcrunch twitter account about an apparent security issue with twitter. See the screen shot below of my twitter timeline. The tweet pointed to a post on Techcrunch. Initially, i took it as the truth but twitter does not have a mass delete fuction(Why dont they?) and it did not seem to be affecting me. So i did not bother with message deletion. Now an hour later, i get this in my timeline. Take note of the time difference. This whole saga is extremely interesting. First Twitter was dragged through coals and then Grouptweet for being a security risk. Now i know in the world of marketing the customer is NEVER wrong, no matter what they do but lets take a look at the facts. It's a fact that neither Grouptweet nor twitter have a security issue. Grouptweet has a pretty simple principal, it takes any messages directed at a specific twitter account and retwits(no pun intended) it. Since some users have public timelines it uses direct messages to ensure privacy for the group. "The service at GroupTweet.com lets you send out private tweets to a group of people at once. To use GroupTweet, create a Twitter account for your group and register it at GroupTweet." The website also clearly states "Create a twitter account for your group" & "Tell all members to follow the GROUP account"
As you can see the instructions are pretty clear. Now, would you not expect the writer for a high ranking technology publisher to understand this simple concept? "Did you do anything different today?" / "Install any software?" "Were you playing with any new twitter Apps?" While also verifying with other users if they were facing something similar, this far we have only had a report of one other user. Though someone posted in the comments of the article that the same thing had happened to them a week ago but they managed to figure it out. Just these simple questions & common sense would have avoided this whole debacle. Also note in the twitter timeline all updates by 3rd party apps clearly state which application initiated the update. It takes only a few seconds to review this. I see this kind of thing regularly from new hires, in an effort to impress they will discover a 'new case', but i ask them questions as it could be someones reputation/job on the line. Eventually they learn to ask the questions themselves. The motivation is recognition and not discovery. In a rush to get the breaking story Michael Arrington did not bother to ask any questions, he wrote first asked questions later. Also take a look at the time the screenshot was taken on the original article. The article most likely started soon after the tweet went up without any questions asked. I believe the more popular and the higher your readership the HIGHER your responsibility should be to ask questions. As the repercussions are worse. Now would you not want to to feel safe in the knowledge that the high ranking technology publishing companies you rely on for news such as techcrunch ask those questions before they publish? You astute readers may have noticed i avoided using the word blog, as the site no longer qualifies as a blog. It's a publishing company pure and simple and even though they have been highly critical of mainstream media. The only difference between traditional media is a sensational headline gets more newspapers of the stands on the web it means more traffic. As long as the 'supposed' mainstream 'blogs' dont ask simple questions and follow some standard journalistic practices mainstream media are here to stay. Therein lies the the paradox, when you 'Monetize' it stops becoming about expressing yourself or making a change it's about the traffic and revenue or taking down CNET(See techcrunch for that article). I hope we have all learned a lesson, cry wolf too many times and people start to doubt your authenticity. Analysing SA Blogs, Where are the black readers/bloggers? Amatomu a round up of South African blogs has just passed their one year anniversary and the stats are quite interesting to note. If you happen to follow the SA blogosphere you can be forgiven for thinking majority of South African are huge rugby fans. Take a look at the screen shot of the most popular blogs in the last 30 days which are publicly available here. The top two sites(Rugbydump & Keo) which account for roughly 30% of the traffic focus mostly on rugby. There is nothing entirely wrong with that as sites like amatomu are 'democratic' and the public choose the best with the number of visits but the statistics become more interesting when you delve deeper to what they actually mean. I do not believe anyone could claim that rugby is the most watched or the most popular sport amongst South Africans yet these blogs are the most popular, this further proves that the blogosphere is not actually an accurate representation of South Africans. "Perhaps there is a need for some affirmative action here." This is just plain silly. It however does point out that Black South Africans are not blogging nearly enough nor are they surfing as much. I haven't seen any statistics on internet usage or access to PC's of black South Africans but i am willing to bet that the imbalance would be represented there as well. Instead of calling for affirmative action, we should concentrate on education and getting people access to computers & the internet. Stay tuned for some practical steps to initiate change. Will the South African Media ever get over the MXit Issue? Recently IOL ran a story called "Lost girls in MXit drama". With Mxit being a South African mobile IM service i have gotten used to these stories. With all the radio shows discussing the issue to the concerned parents constantly calling into radio stations to complain. But seriously now, ENOUGH! These headlines and articles, radio stations make NO SENSE what so ever. The media, the parents and Patricia de lille seriously need to get a clue. I was pretty surprised to find waiting in transit had a post on twitter being blocked in Dubai. He basically questions the authenticity of a post at techtree. I personally just logged on to twitter this morning and as you can see i have been posting tweets regularly. However my internet is provided by Du and the post seems to refer areas covered by Etisalat. A team of researchers have found that your location can be spoofed on the Apple iPhone. This was bound to happen considering the technology being used (Skyhook’s WiFi Positioning System). You can read the full article at cellular news. The use of sky-hooks system is a useful addition to the iPhone and makes sense when you consider that the iPod Touch does not have GSM capabilities. Though this is not the best and most reliable solution for the iPhone considering the GSM capabilities. The run of uncensored internet enjoyed in UAE free zones is over. Today being the first day that the du proxy was switched on i wondered how long would it be before i received the dreaded error message for visiting a 'Questionable site'. After a ton of frantic sms this morning from friends with 'Is (insert social networking/torrent) site working', i decided i would test how long it would take for me to see the message below. Recently one of the news agencies i subscribe to ran an article regarding a global survey on mobile phone usage by teenagers. Unsurprisingly, Nokia seems to be less popular. "Nokia's dominance at the top of the global chart has been weakened over the last 18 months. In the survey, conducted across 31 countries by Habbo, it is clear that Nokia has lost some favour with teens to Sony Ericsson and Samsung since autumn 2006"
"Despite still being the favoured handset in 15 of the 31 countries polled, Nokia loses out to Sony Ericsson in markets such as the UK, Germany, Denmark and Switzerland. In all of these markets Nokia ranked first in 2006."